Gloria Steinem: If you didn’t have control over your own body, you weren’t sure what kind of right you can ask for. What does she mean by “control over your own body”? I believe that you should generally have the right to do what you want with your body, but clearly there are exceptions to that. This sounds like an absolute claim that you should have the right to do anything you want with your own body, and most pro-choice people even agree that’s not true. 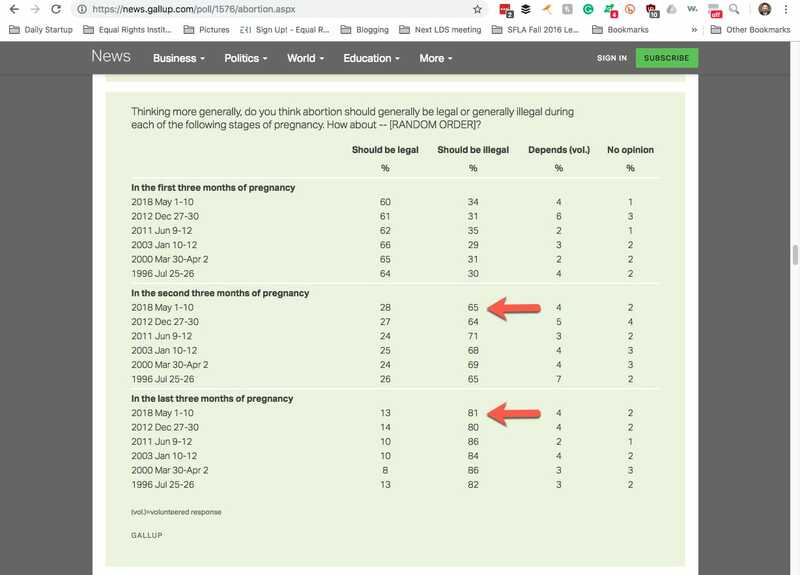 You can see that when you look at opinion polls on abortion, showing that most pro-choice people think that late-term abortions should be against the law, like you see in Gallup’s latest abortion poll, where 65% of people said that 2nd trimester abortions should be illegal, and 81% said that 3rd trimester abortions should be illegal. If “control over your own body” equates to legal abortion rights, then this statement that you need abortion rights to ask for any other rights is clearly incorrect. For example, women (correctly) got the right to vote before they got the right to have abortions. Not all rights are intrinsically tied to abortion. Gloria Steinem (at a press conference in the 70s): It is a political issue. The state means to control our bodies. We produce the soldiers, we produce the workers, and they fear the loss of that control. This strikes me as a much more bizarre claim than the previous one. The government wants control over women’s bodies because they produce workers and soldiers? Look, I can completely understand people being angry at the government over the Vietnam War, but this idea that abortion rights are in question because the government needs women to keep pumping out soldiers is a level of conspiracy theory that is very hard to take seriously. Gloria Steinem: It’s the basis of democracy that you control your own body. And it’s the basis of hierarchy and totalitarian regimes that you don’t. Again, it is reasonable to put some limits on bodily autonomy. Most people agree that there should be some limits on abortion rights. Most people agree that women shouldn’t be allowed to take Thalidomide while pregnant because it causes severe birth defects, originally pointed out by Dr. Rich Poupard. To then compare those reasonable views with totalitarian governments is a ridiculous overreach. It’s a classic “people with my views like freedom and people who disagree are like Nazi’s” kind of an argument. Pro-choice people can do a lot better than that, and, some of them, like Judith Jarvis Thomson, have. For more on understanding and refuting bodily rights arguments for abortion, visit EqualRightsInstitute.com/BodilyRights. Dr. Colleen McNicholas: Because this language and messaging around defunding Planned Parenthood has been so pervasive, I think the general population believes that defunding Planned Parenthood means not paying for abortions. But, in fact, by law, no federal dollars go to pay for abortion. Imagine that a foundation gave ERI a $20,000 grant a year ago, saying that we can do whatever we want with the money EXCEPT for buying video equipment because they don’t care about pro-life advocates making training videos, but they love everything else we do like the speaking trips, outreaches, writing, etc. So we can pay for salaries or rent or trip costs with the grant money, anything except for video equipment. However, that would still help us buy video equipment because that money would go in the General Fund, the same pot that paid for our video equipment. Obviously we would earmark what was done with that specific 20K, but it would still be weird for that foundation to feel like they didn’t help us get video equipment at all. They helped, but in an indirect way. The same thing applies to tax dollars that go to Planned Parenthood. Now they have more money that can spend on paying the light bill or the mortgage of the building where they do abortions. Dr. Colleen McNicholas: There is no other medical procedure, none, not one, that is legislated in the way abortion is. Well…yeah. It’s the medical procedure that many in our society believe to be killing babies. As an analogy, imagine someone arguing in response to the slavery abolition movement once it started effectively passing laws against the slave trade, “No single kind of purchase is more regulated than the purchasing of slaves.” Well, yeah. That doesn’t prove anything. Most purchases are amoral. So are most medical procedures. Senator Wendy Davis: No woman should be judged by someone else, someone who believes they would have made a different decision. No woman should be judged by someone else because these decisions are never, ever easy. They are not made casually or quickly, and those of us in the Senate should refuse to make this decision casually or quickly because the fight for the future of Texas is just beginning. I try to jump to charitable conclusions, and so at first maybe I thought Wendy Davis was being sort of sloppy here and using the word “judged” to just mean obnoxious finger-wagging. But unfortunately that’s not the most natural interpretation of her statement, given the context. She’s fighting a ban on late-term abortions in Texas. No, this is just another tired example of moral relativism, that you shouldn’t judge someone else’s actions as wrong, because you both may have different moralities. Virtually the entire discipline of professional philosophers have abandoned this line of thinking because it is so self-refuting. Sam Harris rants about the stupidity of this postmodernist argument all the time. You don’t get to only judge men’s actions as being either right or wrong. We ought to go through life judging the rightness or wrongness of actions all around us, so that we can keep learning how to live better, more virtuous lives. Of course we shouldn’t be jerks to people, but my goodness. Does Wendy Davis really not judge the actions of Lila Rose or Kristan Hawkins? Of course not. In the end, there are only two ways to interpret Wendy Davis’ statement. Either she is wildly inconsistent, or she is actually advocating for women not having laws apply to them. If a woman poisons her husband, “Hey, no woman should be judged by someone who thinks they would have made another decision.” If she drowns her infant, “Hey, these decisions are never, ever easy.” This is the kind of empty rhetorical statement that sounds all nice and feminist and understanding until you test it. Not all women are angels. Some women do evil things. No reasonable person can believe otherwise, and no just society can simply decide to not ever judge women. Click on the embedded playlist below to watch our response to eight more pro-choice arguments as well as expose the inherent bias against pro-life advocates in the way the documentary is edited. Question: Have you watched “Reversing Roe”? What was your impression?